If you are searching for a fresh start in online dating, it may often be beneficial to try a new platform that hasn’t been occupied with tons of spammers yet. This is what MeetMindful offers. The site works since 2015 and has become popular already. It has 300,000 profiles of active users who are seeking a relationship online. One of the contributing factors to MeetMindful’s success is the target audience of the site. It aims at matching men and women who struggle for a mindful lifestyle in the broad sense. MeetMindful users: Who they are? While there are many definitions of mindfulness in our society, MeetMindful allows one to specify what it means to them. Besides, members should select the extent to which they are devoted to the idea of mindful living. You can communicate with thousands of people who share your ideas, and there is an excellent chance that you are going to find your special one among them. The overwhelming majority of people here are located in the US, although the growing number of users from all over the world join daily. Most members are women, so those searching for female partners might expect to find themselves match with less effort. In reality, it doesn’t mean anything. If a person you need is on the site, you will meet them regardless of the statistics. In case you are seeking a carefree encounter, you might find that this goal is less common on the website, as opposed to meeting a life partner or a friend who shares your values. A new member signs up either with a Facebook account or using a valid email address. This takes a couple of minutes. In the case with the Facebook registration, you don’t even have to spend any additional time uploading pictures as they can be taken from your existing FB profile. These profiles don’t get verified via email while the others do. Nevertheless, the latter is a rather quick procedure too. A genuinely time-consuming part is answering a lot of questions about yourself. To start with, you should indicate your sexuality. By all means, this information is essential for users on any dating website. MeetMindful strives for diversity and welcomes everybody to join the community of mindful people. Nevertheless, the number of questions might seem overwhelming to someone looking for nothing more than a quick hookup. But the relationships most people want to get on this service are to be grounded on a spiritual connection. So, revealing your personality can be a crucial part of your success. Please, spend some time on it. Otherwise, your profile will be empty, which will reduce your chances to find someone special. And, of course, no one will find you because people on MeetMindful tend to ignore empty profiles. MeetMindful has three essential communication tools: likes, messaging, and chat rooms. Here is how they work for non-paying members. Once you have viewed someone’s profile (up to 10 per day), you may like it. If this person likes you back, you get added to each other’s contact list. It includes connections – people to whom you can send messages. It gives you a distinct picture of communicating on the website before you subscribe. Those who decide to buy a paid membership, get a much broader range of opportunities. They are not limited to ten profiles a day and write messages to any person on the website. Plus, they get a chance to adjust smart searching settings in the MeetMindful app, while non-paying members only base their search on the location and distance. What are profiles like on MeetMindful? MeetMindful provides you with a chance to tell the community about your lifestyle and values and find someone very close to you. No surprise there are no ready-to-go patterns to build your profile. Moreover, there are almost no fields in which you can select an answer from a bunch of variants. You should write about this or that area of your life, and it requires time. On the other hand, it pays off because no one can describe your life passions and strivings better than you can. Being able and willing to do it is one of the things that makes you mindful, isn’t it? So, a bit of creativity won’t harm, especially when it helps you find a perfect match. General account info. Indicate your age, occupation, relationship status, religion, height, zodiac sign, diet, etc. The surface level. Here, you can choose what you think your friends would say about you. These words become tags that let others find you easily. The depth level. These sections require you to tell about your lifestyle, values, and beliefs in detail. Anything you write here and in other sections can be altered when irrelevant. 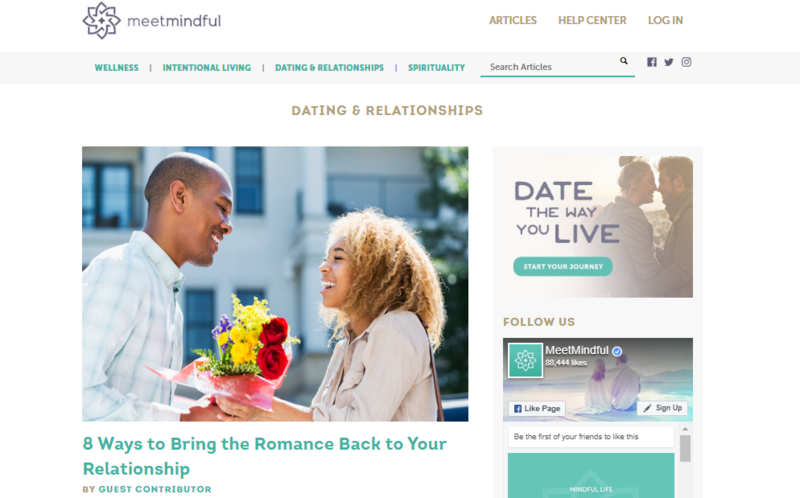 Unlike other dating platforms, MeetMindful gives you much more information about a potential match than a mere photo so that you can choose mindfully. MeetMindful allows one to use the site on the go with an app downloadable to any mobile devices from App Store and Google Play. The app has all the features of a desktop version and looks quite similar. Although mobile apps are supposed to make a user’s life easier, MeetMindful has not achieved that yet. There are countless bugs in the app, but it seems that developers are trying to fix it. Maybe, the explanation is the lack of experience, and it is going to be better sometime later. We’ll see. As for the desktop version, users will love to use that. The interface of the website is very simple. The abundance of information could have seemed too much on any other service, but not on MeetMindful. Everything is in its place, and one can find any description or feature intuitively. The colors and design the team has chosen are relaxing and appealing to those who are in search of balance in their lives. You can spend the whole day on MeetMindful easily without getting bored or tired. It is up to any user to decide whether to pay for using this or that dating service. And this decision might be quite hard because they are not given enough information before they join. Fortunately, this is not the case with MeetMindful. The free membership gives you much of a clue about how the site operates and if it is worth your money. Signing up for free means creating an account and gives you full control over your profile. As we have mentioned earlier, you are presented with the top ten matches daily. But you can like only three people. You can use the contact list, the list of your likes, and some filters for basic search. Plus, you can read articles about relationships and lifestyle the website thoughtfully provides to its users for free. That’s pretty much it, but it is quite enough to get occupied for a while. It is amazing how one can meet an ideal soulmate without paying a penny for using MeetMindful. But in case you want to increase your chances or make your experience with the site even more exciting, you should consider a paid membership. Here, MeetMindful saves you from rushing into any decisions again. You can only pay for a week, as opposed to at least one-month payments on other services. The prices per week vary considerably for different membership plans, so if you are already convinced that MeetMindful is what you need, think about an option that allows saving a lot. While the 1-week trial will cost one $14, the most long-term membership makes it $79 for six months (which is only $3.29 per week!) So, the benefit is quite apparent, isn’t it? switch a browse mode, etc. MeetMindful is a perfect online service for everyone who supports a healthier lifestyle, works on their spirituality and productivity, cares about nutrition, environment, – that is, for people whose values are essential to them. This is the place to discuss different aspects of life, find people with common passions, make new friends, and start a romance based on mutual interests, not just sexual tension. The matchmaking process is partly automatic and the algorithms select singles who might interest you. But you are never to make a blind choice. This is not a dating game, like on Tinder. The communication on MeetMindful is a thoughtful and priceless experience. A lot of people come here to get it, and the chance to find a partner is a nice bonus to them. No matter what your initial goals are, you will love spending time online with people you meet on MeetMindful. Will my Facebook friends know I’m on MeetMindful? In case you register using your Facebook account, some information from it can be synced to MeetMindful. For example, you might choose to download photos from there. But it is a one-way road. Facebook doesn’t have access to your profile on MeetMindful, and no posts appear in your friends’ feed. Can I get a refund when I pay for MeetMindful services? No, nothing purchased on the website or via the app is subject to a refund. Do I have to fill all the fields in my profile? Actually, you don’t have to fill any of them. They all are optional. But please, mind that the more you tell about yourself, the more chances you have to meet the one about whom you will genuinely care. Up to six, both for non-paying and paying members. Do I need to like others’ profiles? Whenever you like someone’s profile, and they like you back, you get added to each other’s contact list also known as the connection section. This is crucial for non-paying members, as this is the only way for them to communicate with other users. What do I do if I’m not interested in a profile selected for me? When the algorithms choose ten matches for you, it might happen that you don’t feel it will work with this or that person. You merely have to click a ‘pass’ button. Mind that non-paying members have no turning back if they click pass on someone’s profile. How do I prevent strangers from writing to me? We’ve discussed that Premium members can write to anyone, no matter whether the connection (mutual likes) has been set. On the one hand, it gives one freedom of communication. On the other hand, it means that any paying member can write to you. MeetMindful cares a lot about your privacy and, once you get a premium membership, you can adjust messaging settings, select people who can write to you, and hide your profile for total strangers.